Dermapen microneedling is fast becoming one of the most sought after dermatologic treatments for collagen induction, treating a wide range of skin conditions including acne scars, wrinkles, stretch marks and ­ne lines. With no downtime and no limitations on your activity, Dermapen microneedling is also a fraction of the cost of other alternatives. Dermapen’s advanced skin microneedling technology uses multiple needles that vertically pierce the skin with an automatic vibrating function. When moved across the skin’s surface it stimulates natural collagen reproduction, whilst allowing fine micro channels to be created in the skin. 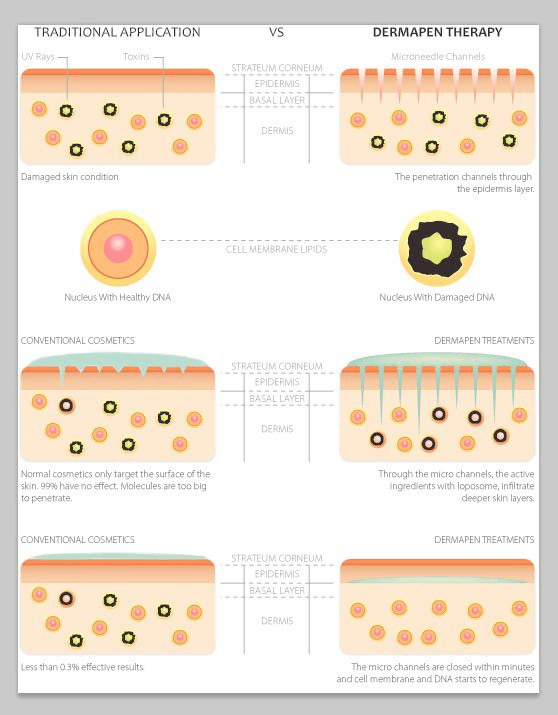 The micro channels can carry up to 80% more topical nutrients, allowing for treatment delivery deep into the skin’s fibroblasts to feed the underlying cells found in the dermis and basal layer. This increased absorption of active ingredients into the skin creates stimulated repair and faster resurfacing results. Advanced skin needling promotes scar-less healing and the deposition of normal woven collagen, similar to fractional laser treatments but without the side effects and downtime. It’s also more effective then most microdermabrasion and chemical peels. 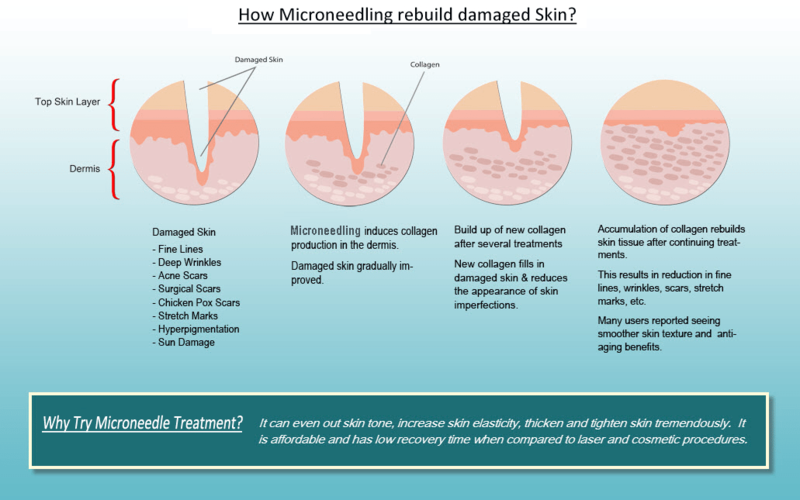 Unlike traditional skin needling rollers, the Dermapen microneedling causes less trauma and has minimal epidermal (skin) damage, therefore reducing pain and discomfort, and making it a safer more effective treatment. The disposable needles eliminate risk of cross- contamination, whilst the adjustable needle depths allow for a treatment tailored to your individual needs. 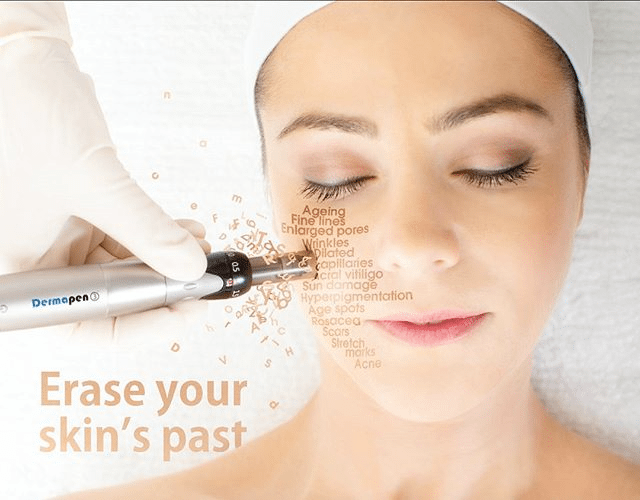 The Dermapen microneedling is so advanced, that it is even suitable and safe to use in delicate and hard to reach areas such as around the eyes and lips and on the nose. Dermapen is a fractional microneedling device that works to tighten, lift and rejuvenate the skin. It’s effective in reducing fine lines and wrinkles, stretch marks, surgical and acne scars. Fractional microneedling or collagen induction therapy (CIT) uses needles to pierce the skin in a controlled and precise pattern. Compared to other skin rejuvenation treatments, Dermapen is safe on any skin type, has short treatment time and minimal discomfort with virtually no downtime. 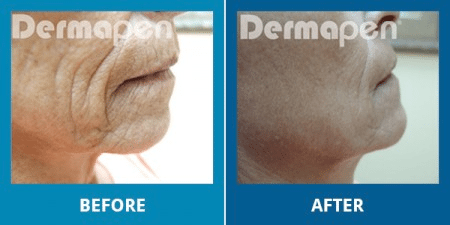 Dermapen: a revolutionary breakthrough for beautiful skin. How many treatments are recommended for rejuvenation, acne scarring, stretch marks and scars? How long should it take before I see results? A Typically, you will see results after the first treatment. Lasting and more significant results will occur after 4 to 6 treatments (spaced 4-6 weeks apart). Your skin will continue to improve over the next 6-12 months after a course of treatments and when combined with the recommended post treatment care. Is the treatment painful? A For minimum needle depths Dermapen treatments are painless. Treatments over 0.5mm deep, a topical anaesthesia cream is applied for 15-40 minutes before treatment and will render the treatments completely pain-free. Is there any downtime after treatments? Generally no, but you may experience facial redness for 12-48 hours after the treatment. Most people are able to return to normal daily activities immediately after the treatment. Application of a breathable camouflage will seal the skin and cover any redness for an immediate return to work. How soon after filler injections can I have a DermaPen treatment? It’s recommended to leave at least 4 days after filler injections so that any post treatment bruising from the fillers can settle. Or have your Dermapen treatment 1-2 days before having fillers injected.